The Case of the Missing Moonstone is the first book in the Wollstonecraft Detective Agency series by Jordan Stratford. I was perusing the new books at our library and this caught my eye. I have a few children who enjoy a good detective story so I was hopeful that this might be one that I could pass along. In The Case of the Missing Moonstone we met two very different young ladies: Lady Ada Bryon and Mary Godwin. 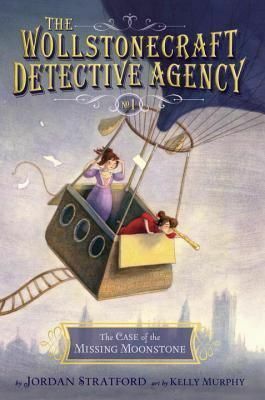 Ada is eleven and spends most of her time alone in a hot air balloon on the roof of her house. She is a bit awkward around people but is a genius; especially at math. Mary Godwin is fourteen and is a friendly young lady who loves a good adventure. These two become the best of friends when their worlds come together. What happens when you put together an isolated genius and a friendly adventurer? You get the Wollstonecraft Detective Agency. This is not your average detective agency. These detectives are in search of the cleverest of criminals. The very first case is a family heirloom that goes missing. There has been a confession but something just doesn’t ring true. Can Ada and Mary solve this case? I must confess that I found this book enjoyable. It take history and science, adds in a mystery, and then tosses in a bit of literary tidbits and presents it in a way that young and old can appreciate. Any synopsis of this book will mention who both of these young ladies really were. Lady Ada was the Lord Byron’s daughter and the first computer programmer. Mary Godwin is the Mary who becomes Mary Shelley, author of Frankenstein. The friendship between the two girls becomes a sweet friendship where they learn to understand their differences and see past them. They find that they compliment each other very well and make an excellent team. As they spend time together, they can look at themselves and see where they need to improve. For example, from being with Mary, Ada realizes that she needs to pay more attention to people around her and to take time to remember people’s names. Mary finds herself riding daily in a carriage with a boy named Charles. Charles is nice enough but this carriage ride is his only time to read because he works in a factory. He ends up helping Mary and Ada out as the story progresses. The author gives a polite nod to Dickens by having the character of Charles. You will also find characters sharing names with some of Dickens’ characters. The crime of the missing moonstone might be familiar as well. It takes from one of the first detective stories: The Moonstone by Wilkie Collins. My oldest daughter happened to be listening to The Moonstone while I was reading The Case of the Missing Moonstone. I guess this is what happens when you have a houseful of bookworms. I would recommend this to readers around the ages of 9-12. It is a good, simple detective story. My eleven year old daughter plans to continue reading the series. If your reader isn’t familiar with Ada Byron or Mary Shelley, no worries. Mr. Stratford tells you more about the real life of these characters and the first story of the moonstone. Have you found any new books lately? This entry was posted in Book Reviews, Books and tagged Books, literature, reading, review by sweetie. Bookmark the permalink.